One of these things is not like the other one…. Having found out their child has a tongue or lip restriction, I often read about parents asking whether they should get it released by a surgeon who uses a laser or scissors. I also often see well meaning people, be they health practitioners or other parents, advise what matters is that the surgeon is well informed and that the tool they use doesn’t matter as the outcomes are the same. While I recognise people really are trying to help, and that knowledge of the effects and treatment of lip and tongue restrictions is currently limited amongst medical and dental professionals, let alone the general community, nevertheless the advice that all tools provide the same result is just not correct. There is no doubt that the best results in the treatment of tongue and lip tie will come from a skilled and knowledgeable provider, especially one who understands the multidisciplinary approach required to achieve optimum results, so it is definitely good advice to encourage parents to seek advice from a surgeon with experience in tongue and lip restrictions. However, that does not mean that the tool used by the competent and well informed surgeon has no part to play in the outcomes of surgery. In fact, the opposite is true. At present, there are a range of surgical approaches to the treatment of tongue and lip tie. There are several reasons as to why each surgeon chooses a particular tool, including their experience with the tool, the cost of the tool itself, whether they treat older infants and toddlers with or without general anaesthetic and whether they consider sutures to be desirable post surgery. The two main approaches are to cut with scissors or a scalpel or to ablate(more on this later) with a laser, although there are different types of lasers also. In some rarer cases, electro-surge tools may be used, although they are more commonly used to cauterise blood vessels in the nose or to perform other minor skin surgery. Scissors cut, lasers ablate and the results of these two approaches are quite different. Ablation, from the latin ablat, meaning to “take away” is a process of vaporizing the tissue, by heating it in such a way that water evaporates and the remainder undergoes combustion, all in a matter of milliseconds. The heating effect stopping bleeding in the process. The speed of vaporizing varies according to the type of laser used, all else being equal. The result of laser ablation is little or no bleeding and complete removal of the tissue. As a result, no stitches are required, and in the vast majority of cases the procedure is performed in a couple of minutes in the chair without the need for general anaesthetic even for wriggly toddlers. The effect of the laser reduces the risk of infection, and many have analgesic effects or boost wound healing, which reduces pain. Cutting by contrast, usually with surgical scissors, has no cauterising or coagulating effect, meaning there is usually significant bleeding when the tissue is cut, if the procedure is performed thoroughly. Often as a result, some clinicians choose to place stitches or use electrosurgery to staunch the flow of blood. The area under the tongue is highly vascular, exacerbating the risk of bleeding. This also means a surgeon may be reluctant to use this method to release a tie underneath the membrane lining the mouth (sub-mucosal) at the very base of the tongue, leading to incomplete release. In many cases for older children, bleeding and stitching requires the child to undergo the procedure while under general anaesthetic. Given the risks of general anaesthetic for young children and recent links to cognitive effects for those undergoing GA under the age of four, GA should be avoided wherever possible. Scissors also crush cells as they cut, stimulating blood clotting factors and inflammation including the sticky healing factors, fibrin and fibronectin, which promote wound healing. With most wounds this is desirable as it quickly allows the wound to heal, restoring the protective layer of the skin. This process is known as primary intention healing. However in the mouth primary intention healing is the process most commonly associated with reattachment of released ties, and hence is undesirable. Lasers by contrast do not crush or otherwise damage the matrix of the tissues being vaporized, so the area around the laser wound shows less inflammation, while the coagulation effects of the laser reduce the production of fibrin and fibronectin. Accompanied by active wound management stretches,secondary intention healing occurs, where the wound heals from the edges, with the cells migrating to reach the centre – rather than sticking the edges together, reducing the chances of reattachment. These are just a few ways that lasers and scissors differ from each other, but there are others. However, the notion that the tools provide the same outcome also fails to pass the logic test. My own practice, and that of a number of very experienced and skilled providers of tongue and lip tie surgery who prefer lasers, is testimony to the following fact. In my practice, as with most Dental Surgeons, I have several pairs of surgical scissors and a number of scalpels. In over 15 years of practice where lasers have been available to me, I have never used either to perform a tongue or lip tie release on any patient regardless of age. The reason for this is simple. I own two lasers that do the job much better, and this means avoiding the after effects of scissors, and reducing post-surgical complications related to reattachment. As well, lasers have no sharp edges and so are safer to use with infants and small children. The disposable optical fibre tips I use on my main laser each cost more than the pairs of surgical scissors I own, meaning treatment by laser costs more to provide every time than the total cost of ownership of the scissors. If the outcome of surgery by scissors and laser were truly the same, why would any experienced surgeon choose to use a tool which costs 1000 times more to buy and more again with every single use? The answer is simply that the laser provides a significantly better outcome and therefore justifies the extra investment. This is the view shared by experienced tongue and lip tie surgeons worldwide. You may be wondering then if laser is so much better, why doesn’t everyone use it? The answer is fairly simple. To use a laser, in most jurisdictions, a practitioner requires additional training and has to jump through a number of licensing hoops. In addition, a laser can cost in excess of $100,000 making it a costly investment for the practitioner. As a result the treatment itself may be slightly more expensive and many practitioners may not be in a position to invest in the best technology available. As a final note, it pays to spend as much time understanding the method your surgeon uses as it does their understanding of lip and tongue restrictions. Generally speaking, if a surgeon has invested in the best technology available, even though cheaper options are available with little impact on the price charged to patients for treatment, then there must be a reason why. ADDENDUM – I’ve recently heard it suggested that a particular benefit of scissors is that they provide for a faster procedure. Firstly one has to be careful that we are talking about a complete release, as given the easy availability of scissors it is not uncommon for the anterior component only to be released. However if we assume that the scissors are being used by a very experienced and highly competent surgeon, then we can assume a complete release done rapidly, however when compared with an experienced laser surgeon using the correct laser with the correct settings, procedure times are not significantly different. Also, be careful about claims that there is no scientific evidence that laser provides better outcomes than scissors. This is a bit like claims that there is no scientific evidence that tongue and lip ties cause breastfeeding difficulties or that their release has no effect and is simply a fad. There are in fact a number of studies that indicate the benefits of laser when compared with scalpel as a surgical tool. Ryu et al (2012) and Jin et al (2010) found that lasers, in particular the Er,Cr:YSGG laser I use, has many advantages for oral surgery when compared with scalpels due to low inflammatory responses and minimal damage of the tissue. Similar results were found in human studies by Ize-Iyamuet al (2013) and Tamarit-Borráset al (2005). Notwithstanding this, it’s also a simple reality that clinical practice is almost always further advanced than published research. An experienced clinician gets immediate feedback as to the efficacy of a particular technique, method or technology from the patient they are treating. Research by contrast can take years to develop a body of evidence that gets published and during this lag, it is all too easy to dismiss clinical advancement by highly experienced practitioners as lacking research support. I am, and several of my colleagues are, already supporting research efforts to improve the empirical evidence to support what clinical practice has already discovered – that when it comes to the release of lip and tongue ties, laser is a significantly better tool than the alternatives. I mentioned at the outset that practitioners use different tools for a range of reasons, and while I hope I have clarified the benefits of laser over scissors or scalpel, it should not be assumed practitioners using scissors or scalpels are poor surgeons. In fact, I know of many excellent surgeons who use scissors and scalpel who provide excellent care to their patients and are dedicated health professionals, but this doesn’t mean that the surgical outcomes of the different tools are the same. Now, I could talk about different lasers and why some are better than others, but that’s an article for another day! 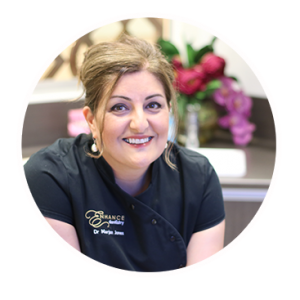 Dr Marjan Jones is the principal dentist at Enhance Dentistry and has treated thousands of children and adults with tongue and lip restrictions. She has 19 years clinical experience with lasers, is a Fellow of the World Clinical Laser Institute, a member of the Academy of Laser Dentistry, a member of the Academy of Breastfeeding Medicine and regularly speaks about the identification, treatment and lifelong effects of tongue and lip tie. Goldman L, Goldman B, Van Lieu N.(1987) Current laser dentistry.Lasers Surg Med 6(6):559-562. Pié-Sánchez, España-Tost, Arnabat-Domínguez, Gay-Escoda (2012) Comparative study of upper lip frenectomy with the CO2 laser versus the Er, Cr: YSGG laserMed Oral Patol Oral Cir Bucal.Mar 1;17 (2):e228-32. Cecere W, Liebow C. (1990) Laser causes greater growth factor release than scalpel.Lasers Surg Med ; 10(Suppl 2):22, Abstract 79. Research, Science and Therapy Committee of the American Academy of Periodontology. Lasers in Periodontics. (2002)J Periodontol. Oct;73(10):1231-9. Tamarit-Borrás M, Delgado-Molina E, Berini-Aytés L, Gay-Escoda C (2005) Removal of hyperplastic lesions of the oral cavity. A retrospective study of 128 cases.Med Oral Patol Oral Cir Bucal.Mar-Apr;10(2):151-62.